Last year, the Obama Administration released its first-ever National Strategy for Global Supply Chain Security. As stated, the main goals of the strategy are to promote the efficient and secure movement of goods and foster a resilient supply chain. Maintaining a secure and resilient supply chain is certainly critical to ensuring the prosperity of the United States’ economy. However, existing legislation governing maritime cargo transit and port security directly contradicts the goals of this strategy. In 2007, Congress mandated that 100 percent of the approximately 32,000 cargo containers entering U.S. ports each day be screened. The feasibility of this mandate has been questioned by security experts from day one. In seeking to establish a workable alternative, Congress should consider supply chain realities in fostering a risk-based approach to maritime cargo security. Given the extensive economic importance of the maritime supply chain, the vulnerability of maritime cargo to terrorist and other malicious attacks has long been a concern. With this concern heightened after 9/11, Congress and the Administration moved to create a risk-based approach to strengthen maritime security centered on analyzing cargo attributes, such as contents and origin of the cargo container, to single out high-risk cargo for further inspection. 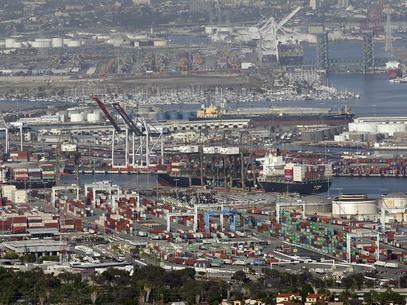 By 2006, however, Congress turned sharply away from the risk-based approach with the passage of the Security and Accountability for Every Port Act, which called for testing the feasibility of scanning 100 percent of U.S.-bound cargo, a requirement that was fulfilled though the creation of the Secure Freight Initiative pilot program. While the program showed that “scanning U.S.-bound maritime containers is possible on a limited scale,” major challenges existed in expanding 100-percent scanning to all 700 international maritime ports handling U.S.-bound cargo. These findings, however, would be disregarded, and Congress moved to mandate that 100 percent of all U.S.-bound maritime cargo be scanned by July 1, 2012—prior even to the pilot program’s completion. Proponents of the 100-percent mandate have pointed to the supposed success of mandating 100-percent screening of air cargo. Besides the fact that this screening was limited to domestic cargo—screening of U.S.-bound international cargo proved much more difficult—and that a significantly greater volume of cargo transits through the maritime supply chain, another critical difference is that the air cargo security mandate called for the 100-percent screening of all cargo, whereas the maritime cargo mandate calls for 100 percent scanning. While screening calls for cargo to be assessed for risk on the basis of contents, origin, and other attributes, scanning means that each of the approximately 10.7 million maritime cargo security containers entering U.S. ports each year must be physically scanned. The growth of maritime cargo containerization in recent decades means that typical maritime cargo containers often measure some 40 feet in length. One key issue regarding screening maritime cargo is, therefore, one of scale. While the basic technology exists to effectively screen cargo containers, the expanded technology necessary to perform this function on the larger forms of containerized cargo largely does not. Cost and infrastructure are also important factors. A single x-ray scanner, the most common technology used for cargo screening, can have a price tag of $4.5 million, plus an estimated annual operating cost of $200,000, not to mention the roughly $600,000 per year for the personnel required to run the equipment and examine the results. Likewise, the mere placement of scanners can also cause logistical problems, as many ports were not built with natural bottlenecks through which all cargo passes. With today’s economy relying heavily on the timely and efficient movement of goods, such delays could amount to around $500 billion in total profit loss. And once scanning technology is installed, it may encounter multiple problems, such as incompatibility with previous technologies, outages due to weather, and insufficient communication infrastructure to transmit electronic data to the U.S. National Targeting Center-Cargo, where it is assessed. A large part of the post-9/11 anxiety regarding maritime cargo security has centered on the “nuke in a suitcase” scenario, an extremely low probability event. The vast majority of cargo traveling through the maritime supply chain consists of legitimate goods. The 100-percent maritime screening mandate, however, fails to recognize this reality and instead treats every piece of cargo as a genuine threat. Congress should rethink the 100-percent cargo security mandate and instead return to a risk-based approach to cargo security, centered on analyzing manifests and other data, to single-out only high-risk cargo for further inspection. Ensuring the security and prosperity of the maritime supply chain is simply too important for Congress not to get this right. Emil Maine is a National Security Research Assistant at the Heritage Foundation, where he conducts independent research on U.S. defense posture. The views and opinions expressed in this article are his own. The MV Alaed, a Russian cargo vessel reportedly shipping armament to Syria, including attack helicopters, has lost its insurance coverage due to illicit cargo clauses, CNN reports. This comes after calls from the U.S. government on the British government and subsequent pressure on London-based The Standard Club, insurers of the vessel’s owners, FEMCO. 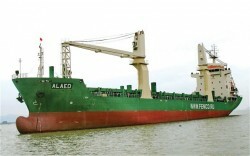 Dutch authorities hailed the Alaed as it passed the Dutch coast, prompting the vessel to turn north. Alead is reportedly near the Hebrides archipelago off Scotland’s west coast, according to The Telegraph. Scottish site STV.TV says the vessel “was last recorded under way less than 55 miles off the coast of the Port of Ness village in the Isle of Lewis,” and headed for Vladivostock according to AIS information (possibly falsely inputted) provided by the ship tracking site marinetraffic.com. The vessel has since moved out of range. Press reports indicate British Foreign Secretary William Hague has confirmed Alaed is returning to Russia, most likely Kaliningrad. Maritime experts speculate it was ordered to turn back by Russian authorities as it may have had enough fuel to reach Syria without stopping and not been subject to the EU’s ban on weapon shipments as a Russian vessel. The Alaed is just the latest in a series of cargo vessels bound for a war zone suddenly thrust into the spotlight after reports surface of a purported arms shipment. The Kang Nam, a North Korean cargo vessel turned around in 2009 after the world’s attention focused on its voyage to a mystery destination (likely Myanmar) with a mystery cargo (likely small arms and RPGs). Similar incidents have occurred in the past with North Korean vessels such as 2011’s MV Light incident. As with the Kang Nam, the objective of the international community in this incident is likely to deny the Alaed an ability to refuel in a friendly port of call enroute to its final destination. With the loss of insurance, the Alaed will find it difficult to legally enter many ports on the way to Syria and may be forced to turn around. If the vessel is able to continue, it runs a good risk of being boarded by some of Syria’s more proactive neighbors enforcing an EU arms embargo, such as Turkey, which boarded the German-owned Atlantic Cruiser in April after similar reports of on-board weapons. Embarrassingly for Turkey, such reports turned out to be false, so they might be more reluctant to repeat the episode with out definitive proof before hand. Nor are all suspect cargoes bound for the al-Assad regime. Also in April, Lebanon stopped the Sierra Leone-flagged Lutfallah II, which definitively was smuggling weapons for the Free Syria Army.